It’s interesting how the meta for World of Tanks keeps changing. Just after release, the big idea for most players was moving up a selected tree, and getting their Tier X tank. Whatever it was. These players then moved on to adding additional Tier X’s to their garage, usually for clan wars reasons and a desire to get “the best tank”. Adding clan wars and E-sports rounds out the “lofty” goals for the metagame. I did things a bit different. 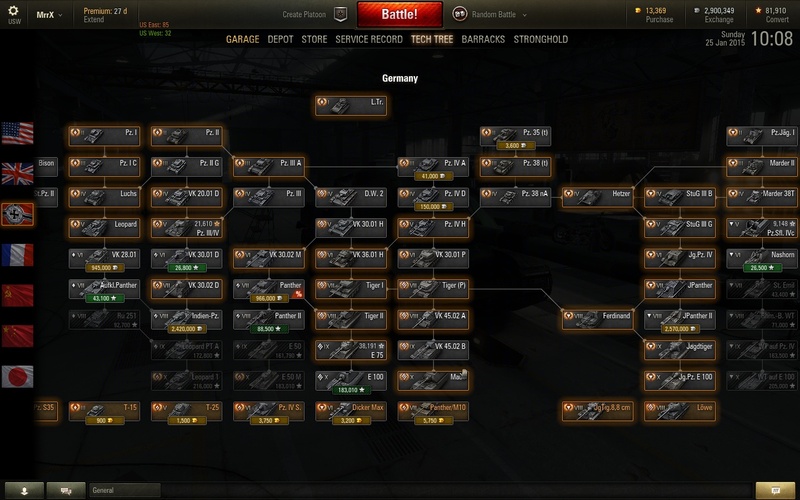 Without a specific goal in mind, I think I can back into it better at this point by saying I wanted to unlock the entire German tree – this is the rare “Technical Engineer” achievement. This goal still has a LOOONNGGG way to go. Not expecting to achieve this in 2015. I next found myself moving up many different trees, and keeping most of the tanks earned along the way. This shifted me to being a “Tank Collector”. And after getting (a very large number) of tanks and tank slots, I find the collector allure fading. When you own a tank and can’t ever play it, why did you find it necessary to get it again ? Tier X play isn’t that much fun for me. Why am I running the matches exactly ? I don’t play clan wars. There’s nothing to unlock. You don’t make silver credits, you lose them. The handful of Maus and JPE100 matches I’ve had have been enough. And if I want to see my crew improve, that’s what premium tanks are for – which both improve the crew, and make money. I guess the question of “Is the Tier X fun ?” is not as relevant as you’d think, given the other game choices. Move up the trees and unlock tanks. It takes a very long time to do this, leading to secondary goals. Move my tanks up my personal match history as desired. This included the finally finished “Project 370” as well as, why are tanks that I own on the bottom of the list ? I have all kinds of personal points that I (just barely) want to move my tanks past, from 10-12 matches all the way up to over 185. I am pretty sure no one reading this really cares about how many matches I’ve played in a KV-2, etc. But I bet you care about your own list. Maybe a little, and maybe a lot. That makes this another piece of the meta game. Finish the personal missions. Talk about scattering the metagame. I have to play specific tanks to move this forward, which conflicts with Goal #1. I have spent the last week progressing the missions, and now need Light Tank # 10. I’m finding getting 1,000 assist damage difficult, to say nothing of not being spotted, which is the mission requirement. 700-800 happens a lot, so I’m sure I’ll hit it at some point. With two TD’s on the “Bottom” of my personal match history, I started trying to complete TD #1 as well, and I’ve finished it, but not yet with honors. So it looks like the game will now be a slow progression along many, many different fronts. This also means it’s more difficult to blog; I have to look for game outliers where I do something “Awesome”. But the game still continues. And then there’s the “super secret game” that I can’t talk about other than to say “Wow”. Or maybe I’ll double that – “Wow”s. Heh. As reported by World Of Tank’s own Overlord, the USS Iowa will be getting a visitor center with game stations in it. Guess what they’ll be running ? WG.net is looking to do two key projects; one is a gaming center below deck, where people who come on to the museum and have an opportunity at the end of the tour to get to play some of the Wargaming products. The other one is a bridge experience, where we want to work with the museum to create a mock simulation of what it would be like if this ship was in battle and being attacked be warplanes. In the ship’s below-deck digital theater, WG will offer a window into the past. A virtual video experience from the bridge will recreate the ship’s role in supporting the American landings at Okinawa, Japan, in 1945. Visitors will see the ship’s impressive turrets as its 16-inch guns rotate and fire at their targets. Hopefully, this will actually happen, and I’ll be able to give the virtual world a on-hands report, since I’m in the LA area. Clearly will take a while to actually happen – if it does at all. I’ve been hearing in the press about the move to bring the battleship to LA and love the idea; so little history gets preserved, it seems to me. Ships certainly seem to get a lot of good treatment, like the Midway in San Diego. That was a fun tour. Motivated by the gaming connection, I discover opening is not really stated even vaguely. Planned for July 2012 is the refurbishment; so Wargaming must be responding to this. So plenty of time to wait until anything is seen, but I sure like the idea.